Stuart Rennie – He didn’t catch Fergie’s tea cups but almost caught a right hook! I have a curiosity. A fascination some may call it. I don’t think I am alone, if the feedback to my previous article on Willie McGuire, the Airdrie winger is to be believed (can be found on www.burstbawpodcast.net). In true confessional style...my name is Gareth and I am fascinated by the life and times of Scottish footballers from yesteryear. 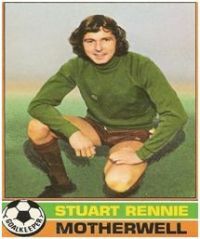 Next under my scrutiny is the former Falkirk, Motherwell and Ayr Utd goalkeeping legend, Stuart Rennie. I say legend, as there are not many men that currently walk the streets that can say they have played in the same team as two Scottish managerial icons, been the centre of controversy in two consecutive cup semi-finals, conceded a goal against a fellow keeper, nicknamed Big Basil and wore the same underpants for years whilst playing. Nope, not many can put their hands up to that little list. Enjoying a career resulting in almost 500 professional appearances, Stuart chose to continue with his full time profession with the Civil Service, therefore his football enjoyment was strictly part time. In fact, when with Motherwell he rarely trained with the team, turning up on match days and doing what he did best...keeping the ball out of the net. But it is perhaps equally the clientele that Stuart rubbed shoulders with during his playing days that he could claim as being his story for the grandchildren. There are not many players that can list two Scottish national team managers as their team mates. And certainly not many who had them in the same team! Enter stage left, Sir Alex Ferguson and Andy Roxburgh, who formed a lethal goal scoring threat for Falkirk as they drove Falkirk to promotion to the top league in 1969/70. Ferguson knocked in 17 goals in that season, with Roxburgh chipping in with 15 for a Falkirk team who were regularly getting 5000 plus spectators into Brockville. But it was Stuart’s job to keep the opposition out and he did so with aplomb, playing his part in the season’s success. A move to Motherwell eventually followed, where he made over 200 appearances for the Steelmen (ironicallyAlex Ferguson scored against him in his debut for Motherwell at Ayr Utd). A successful period for Stuart, playing in the top league of Scottish football. It wasn’t without controversy mind you. Starring in a cup semi against Airdrie, Stuart was penalised for taking more than the allocated 4 steps whilst in possession of the ball. One of the very few keepers to fall foul of the now obsolete law, Airdrie scored from the resultant free kick and clinched their place in the final. Rollo Kyle, the referee, was never invited to Stuart’s home for tea and cake. But Rollo did make it onto the Scottish FA suspended list for receiving gifts from AC Milan prior to a UEFA match in 1978. But that is another story for another day. The naughty boy that he was. Bad luck was to follow the following season in yet another semi final, when referee John Gordon (another who was no stranger to controversy, being the referee in the aforementioned AC Milan match would you believe) was to award a penalty to Rangers after Derek Johnstone dived ‘swan like’ in the box. Mr Johnstone, years later, admitted he perhaps ‘made the most of the situation’. So it’s not a modern phenomenon. 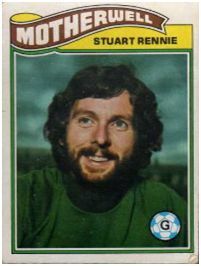 Stuart was affectionately known as ‘Basil’ in his post professional playing days in the Edinburgh leagues, basically because at the time he bore an uncanny resemblance to Mr Fawlty himself. He was also known for his rather scruffy Y-Fronts when playing in the twilight of his career which he wore for superstitious reasons. 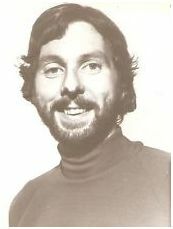 Stuart finished his professional career with Ayr Utd, starring in the same team as future Scottish international Steve Nicol, racking up over 100 appearances at Somerset and being caught out by a force gale wind influenced clearance by the East Stirling keeper which sailed into the net. Another eventful period in his career! The one thing that shown through when researching Stuart’s career was how well liked and respected he was/is amongst football fans. Very similar to Willie McGuire who I turned the spotlight on in my previous article. Good guys, admired and respected by the ordinary man in the street. Why? Because they were the ordinary man in the street. And when you are next picking your vegetables in Morningside, or queuing in the post office, or in the local park, you just never know. You could be in the presence of a local legend who shared a bath with Sir Alex. Now there is a thought! PS Stuart was quick to point out to me the fact there was one Ayr Utd fan who perhaps did not share the same respect as the majority, positioning himself behind the goals for each and every one of Stuart’s home matches at Somerset Park and shouting abuse at him that would probably get him arrested these days. What do you remember about your Falkirk days with Andy Roxburgh and Sir Alex? Andy was similar to me in that we were both part time players. Andy fancied himself as a bit of a runner and we used to race each other at training (I cannot remember ever having any dedicated goalkeeping practise!). He never ever beat me and I don’t think he was too happy with that. I remember Andy scoring 4 goals in a game then coming to training during the week. We were talking about his feat and the forthcoming match and to our astonishment Andy said he may not even get a game this weekend, despite his goal scoring feats. Just brought out a bit of a lack of confidence he had at the time. This was really interesting, considering the career and success he has had after his playing days. 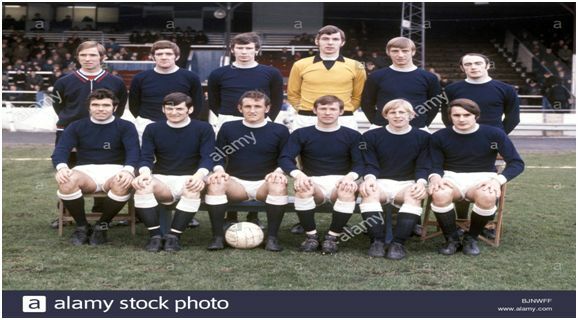 Sir Alex played in the same team as Andy and I when we won the 2nd Division Championship with Falkirk in 1969/70. I remember Sir Alex wasn’t too fond of goalkeepers! Oh and he was a bit fiery, let’s say. I remember playing in goal one night game at Dundee and the sun in my eyes was horrendous. I could hardly see and we quickly went 2 nil down. Half time came and Sir Alex wasn’t too happy, blaming me for the goals. It was a classic case of confrontation between 2 players, which didn’t come to blows only because we were both being held back. We certainly went for each other. After the game, he came into the baths with me and apologised. We got on well after that. Best player I played with was Bobby Graham at Motherwell. He made lots of Willie Pettigrew’s’ goals. There were a lot of great players in the Motherwell team at the time but Bobby was great. Ian St John brought him up from Liverpool. Great controller of the ball and very tricky. Not great pace mind you. Pettigrew loved playing with him. Peter Marinello, Jim O’Rourke and Bobby Watson were all great players as well mind you. Played against? Being a keeper, every single player I played against was a problem to me. Even the opposite keeper could cause a problem because as you know, one scored against me! I have played against George Best, Kenny Dalglish, Allan Mullery and Bobby Moore. I played against Celtic in, I think, 1968/69 when their team consisted mostly of players from the Lisbon Lions team (drew 0-0). The Ron Atkinson West Brom team was great also. I played against them at Motherwell (lost 8-0 athome). All great players and big names but every game I played there was always somebody that could cause me problems. You played with a couple of Motherwell legends, namely Willie Pettigrew and Peter Marinello. What are your memories of these players? Most memorable manager you played under? My first manager was John Prentice at Falkirk. Really quiet manager. I remember coming into the dressing room after being beat 5 nil and he didn’t say a word. Extremely calm. My first season at Falkirk didn’t go particularly well for me. End of the season, John called me into his office (as he would with each of the players). I thought I was for the off but he said “Stuart, next season we are going to make a goalkeeper out of you”. He had confidence in me. Ian St John was another manager. High profile and big personality. Ian was very much a player’s manager, he liked sitting at the back of the team bus with the players. He was very good to me. At Motherwell, Willie McLean was the most tactical of my managers. Very approachable. I finished at Motherwell with Ally McLeod. Ally got rid of me at Motherwell and I went to Ayr...rejoining Willie McLean. Mind you, as far as memorable is concerned, winning Player of the Year in my final year at Motherwell under Ally McLeod and then being let go by him was fairly memorable! All memorable managers in different ways but I would go for John Prentice for keeping me on at Falkirk when he could have dumped me and Ian St John for being a good man manager. As a Morton fan, I need to ask what are your recollections of playing against the Ton? What do you remember about the 4 step controversy? It was absolutely ludicrous. I think I was the only goalkeeper to be ever caught out by it. I remember having the ball in my arms and every time I took a step left or right, the opposite player did the same. The referee didn’t give a free kick for the guy impeding me. He gave a free kick for me taking more than 4 steps. It was a stupid rule. Really stupid. They (Airdrie) scored from it. I got the blame for it and we got beat. Mind you, we missed chance after chance in that game...but I got the blame for taking more than 4 steps in the box which led to their goal. Did you really wear the same underpants for years? And finally, how would you look back on your career? Many thanks to Gareth for permission to host the interview. Share your thoughts on the messageboard.